The new version KADoNiS v0.3 is finally online! 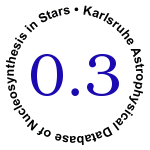 Version 0.3 provides data for 357 isotopes including 5 newly added isotopes, 42 updated MACS30, new stellar enhancement factors, and the MACS30 obtained from three different evaluated data libraries. More information below or in the logbook. The KADoNiS project is an online database for cross sections relevant to the s process and p process. The respective s-process library provided on this webpage is an updated sequel of the well-established Bao et al. compilation . Astrophysical Database of Nucleosynthesis in Stars"
Submitted as proceeding of the workshop "EFNUDAT Fast Neutrons - scientific workshop on neutron measurements, theory & applications" held on April 28-30 2009 at Geel, Belgium. Version 0.3 - online since August 28th, 2009 - has now recommendations for 357 datasets, including new datasets for 2H, 9Be, 60Fe, 138La, and 42 updated MACS30 (see figure above). For 79 datasets (22.1%) only theoretical predictions are available. No experimental information (in the stellar energy range) exists up to now for the 12 stable isotopes 36Ar, 38Ar, 40K, 50V, 72Ge, 73Ge, 77Se, 82Se, 98Ru, 99Ru, 131Xe, and 158Dy. New stellar enhancement factors are available (T. Rauscher, priv. com. ), and the MACS30 obtained from the evaluated data libraries ENDFB7, JEFF3.1 and JENDL3.3 are now also included. More information in the logbook. All lists are in Tab-separated ASCII format. All previous versions and changes can be found in the Logbook. The MACS30 from KADoNiS v0.2  were also used for an update of a reaction library from Basel university. 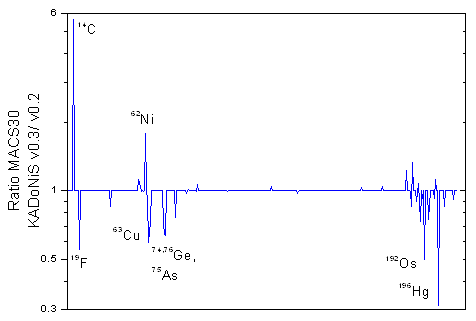 During the CARINA-JINA Collaboration meeting in Trento (May 29-June 1, 2007) a request for an extension of KADoNiS with a few more radioactive isotopes relevant for s-process nucleosynthesis with higher neutron fluxes (up to 1E11 n/(s*cm3)) came up. A (preliminary) list can be found here. If you have suggestions for other additional isotopes, please contact us. Atomic Data and Nuclear Data Tables 76 (2000) 70. AIP Conf. Proc. 819, 123; online at http://www.kadonis.org"